I recently purchased a Geeetech (clone/knockoff) off ebay for a small $5, and wanted to test its functionality for use with my Flight Sim devices. The CY7C68013A is the same chip used in the Salae logic analyzer (and ripoffs), so figured it should have pretty decent performance. Despite being used in quite a number of logic analyzer type projects, I couldn’t find any decent beginner information for it, so this will try and fill the gap; especially for windows users. This first part post will describe settings up the environment, and the second post will delve into the features of this dev board and chip. The chip board presents 20 GPIO ports (With 2 interrupt pins), a i2c bus, dedicated USB pins, and a couple of ancillary pins. Its work noting that the 56pin SSOP doesn’t have a serial port, which is a bit disappointing. The board itself has 2 LEDS, D1 and D2 attached to the PA.0 and PA.1 ports respectively. This ties up both the interrupt pins, so will only be useful for initial testing. Programming the chip is done via the EZ-USB software provided by Cypress (Or its open-source equivalent which only seems to be available on linux). 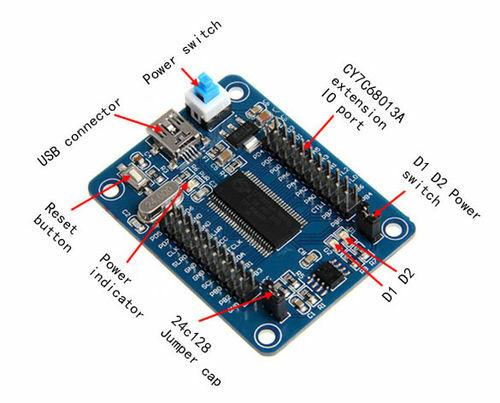 The software can download a compiled .hex file directly to the RAM of the chip (Lost after reset), or the EEPROM provided and accessed via the i2c port. Data on the EEPROM will survive resets, but the chip must be disabled by adding J2 on the board before trying to reprogram it again. Now we just have to build the code, and upload an example to the dev board. The below will write the code to the RAM, which will be lost after reset. The file will be uploaded to the board, and the leds will start alternatively flash. 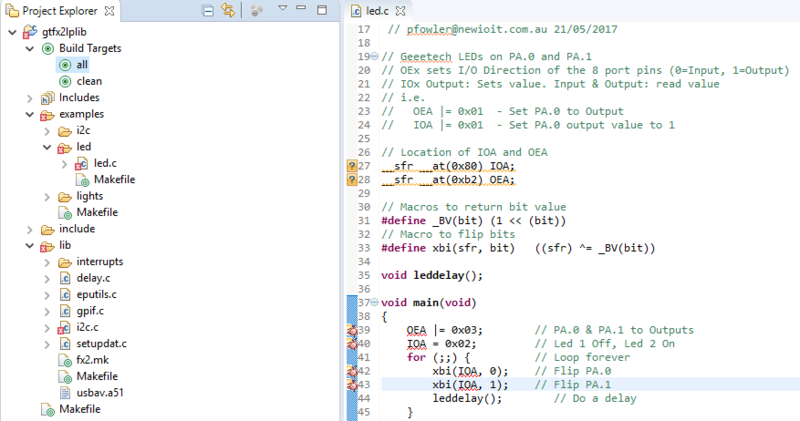 Here is the code use for the ‘leds’ example. It deliberately doesn’t use the gtfx2lplib files as to allow a base example of whats happening. There is also the ‘lights’ code, which uses the library itself to run its functions. Click on the ‘Lg EEPROM’. The above procedure must be repeated each time you wish to program the EEPROM (i.e. replace the jumper, reset, remove jumper, program. I find it easier to do inital development work using just RAM, and then program the EEPROM with code when im ready to more production style testing. 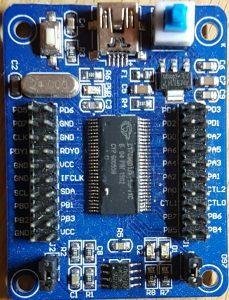 This entry was posted in Electronics, Examples, Tutorials on May 25, 2017 by pfowler.